I seem to have an aversion to New Year's resolutions. Maybe it's because (apparently) 88% of those who make them don't keep them. You're pretty much doomed to fail from the start. But I do like to have New Year's 'intentions', which feel a lot less intimidating to me. They aren't promises. I don't resolve to do anything. I simply intend to. It's less pressure. But there they are, floating in the back of my mind and somehow, over the last few years, I've managed to keep them. My 2014 sewing intentions were knit-related. I wanted to sew something in knit fabric (other than leggings) and also try out my double needle. Seeing this photo was the nudge I needed to give it a go. I had this very fabric sitting on my shelf. But it's quite lightweight and I worried it would look too nightgownish as a dress. 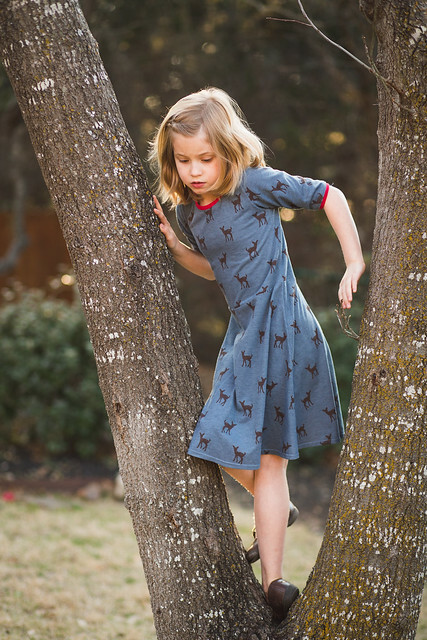 Yet, when I saw it in the Oliver + S Playtime dress pattern, it didn't look nightgownish at all. I loved it. 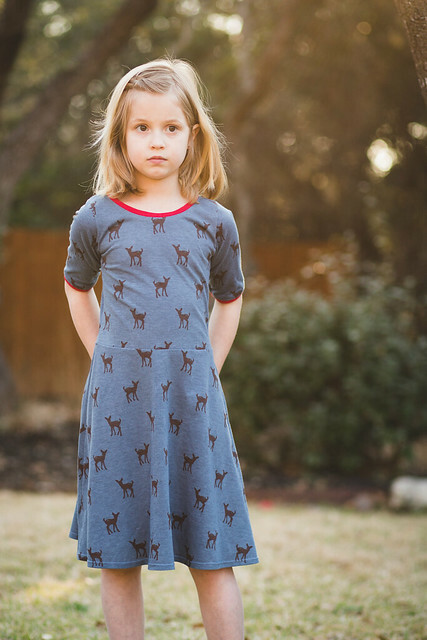 So I bought a pattern I had been eying for a long while - the Skater Dress. One reason I resisted sewing knit shirts and dresses was because I feared the dreaded neckband. I've read a lot about sewers struggling to get it right. It sags or looks wavy. I'll admit, I am a perfectionist with my sewing and that would drive me crazy. As it turned out, it wasn't nearly as difficult as I imagined. It did take me a couple of tries to get it right. I made the mistake of sewing it with my machine stretch stitch, which was very difficult to unpick when it looked awful after my first attempt. The unpicking ruined my neckband and I had to cut a new one. There was a bit of an art in getting the stretch just right. On my second attempt, I used a long straight stitch, then finished the seam with my stretch stitch after I got it right. That worked beautifully. When it was time to hem the dress I googled double needle tutorials. I landed on this one. Did you know using a double needle is as simple as changing your needle and increasing your straight stitch length? You don't even need two spools of thread. You can simply wind some thread onto a bobbin and place the bobbin on top of the thread on your spool. It's so simple and the results are amazing. Even my kids were impressed. Indigo teased, "Mom, did you sneak out and buy that at the store and then pretend that you made it?!" :) I have to remember to make all of my New Year's intentions this easy! This dress came together quickly. I'd venture to say it was faster than sewing a dress from woven fabric, neckband challenges and all. As Indigo grows, she seems more drawn to knits than wovens so I can see my sewing moving in this direction to grow along with her. I loved this pattern and felt it was a great beginner pattern for learning knits. I did adapt the sleeve length as well as the width of the cuffs. Since Indigo is a string bean I cut the pattern in a size 5/6 for width and 7/8 for length, which is what I generally do when sewing for her. It fit perfectly that way. 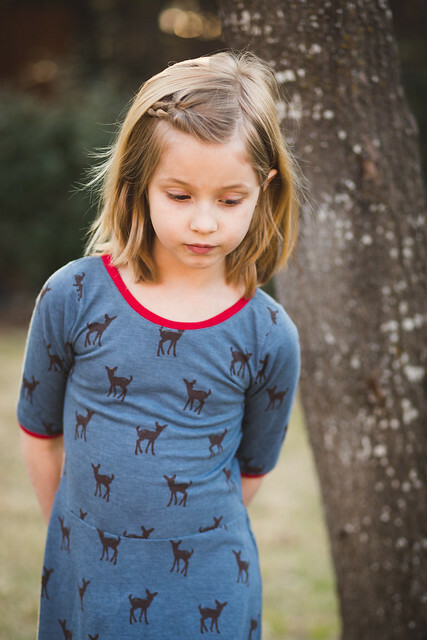 And speaking of Ms Indigo, she looks rather forlorn in these photos, doesn't she? The truth is, after I put her dress on to take photos, our nine year old neighbor knocked on the door asking if Indigo could play. So I had about three minutes flat to take these before she was off to far more important matters... like building fairy houses with our neighbor. It looks awesome! And yay for sewing with knits! Congrats on the neckband/double needle mastery, you're unstoppable now. My favorite knit pattern is Rae's Flashback Skinny tee...so versatile, especially if you happen to have another boy on the way. It's fantastic! You've made yourself look like an absolute pro with this. Love the colours and it does make her look so tall and grown up. Just lovely. Double needle hems do seem like some clever secret once your onto them. They just look brilliant. The dress looks great. I never would have guessed this was your first knit neckline - it looks perfect! It's hard for me to believe that you haven't sewn much with knits because you're my sewing guru. 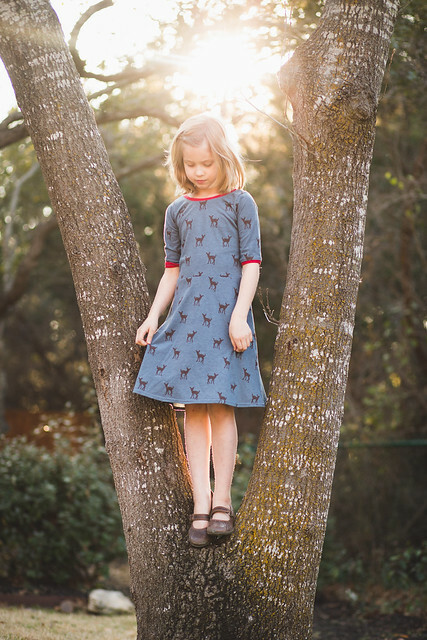 This dress is so cute (little deer!). 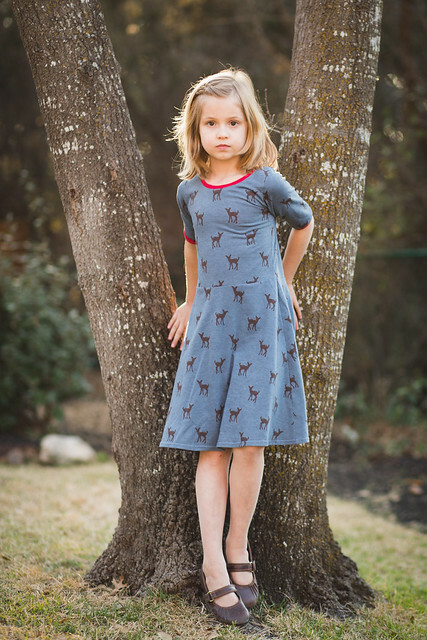 And I just love knit dresses for girls. They're just so comfy and practical. You and your twin needle are going to be unstoppable now! Oh and happy almost birthday!!! It looks great! 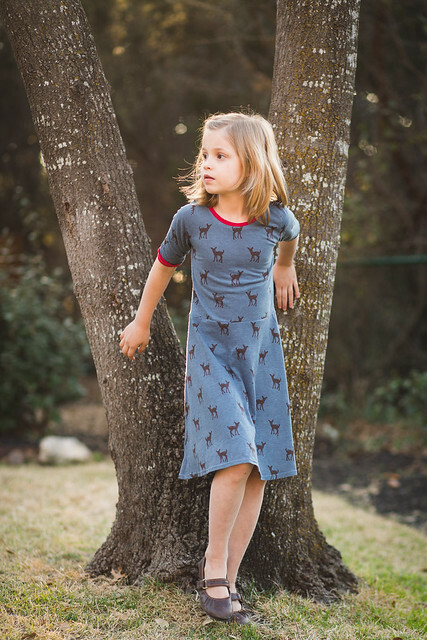 I agree with Carolyn - first of all, you're such an accomplished seamstress in general, it's hard to believe you'd be intimidated by anything, let alone knits; second, this dress is so perfect, no one would ever believe it's your first non-leggings knit project! I love the twin needle - it really does look so nice, even if the set-up is a bit of a pain. I serge my necklines on (risky!! but I like to live on the edge), then topstitch with a long straight stitch. I don't know WHY it works, but it does! You are my clothing hero. if I wasn't on a pattern buying fast right now, I'd be snatching that one up! 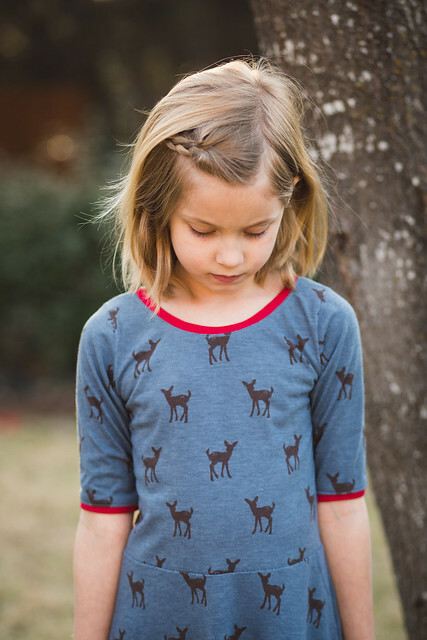 Love the comfy, twirly style of it and love it sewn in that adorable print. Well done! Glad you are enjoying the joys of a double needle - I, too, was pleasantly surprised that it wasn't as horrible as I had feared. Now the walking foot . . . still scared of that one! Hope you had a lovely birthday! The dress looks great- practical but also so pretty. I also have some thin knits sitting in bins- nice to know that these one at least worked for a dress!